Sustainability starts by preserving existing buildings through savings in labor, materials, transportation, and all the embodied energy stored within. 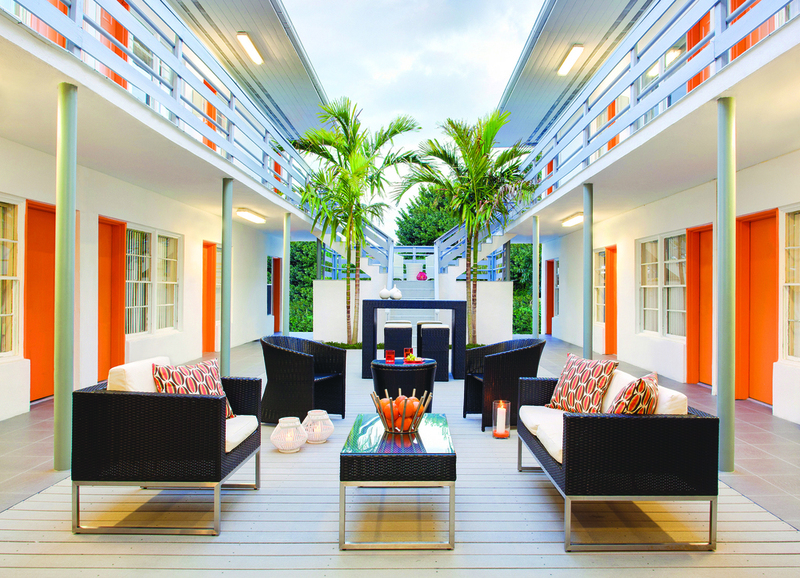 The re-branded Motel Bianco is a 1950's building, originally designed in a mid-century local vernacular style referred to as "Mimo" (short for "Miami Modern"). The lengthy design and construction process started with a dilapidated motel building with a bullet-proof customer service counter in a “up and coming” area of Miami’s Biscayne Boulevard corridor. Full of potential, the structure was underutilized and unwelcoming. The end result, product of a collaboration between DEN Architecture and Dada Associates, maintained the building’s historic character while upgrading it to current building codes. The majority of work occurred in the lobby and the courtyard. Walls and partitions were removed to create a light-filled, spacious lobby with tropical tones and retro-modern furnishings. Decorative railings and historic motifs were faithfully preserved and integrated with the proposed design. The courtyard, previously a neglected concrete patio, became a lively social scene with composite wood decking made of recycled plastic milk jugs, native tropical landscaping, and comfortable outdoor furniture. With the remodel, the motel became a boutique lounge, increasing occupancy tenfold. The clientele is now a diverse crowd of artists and tourists from all over the world.